CRAZY Sam's Club FREE MEMBERSHIP IS BACK! CRAZY Sam’s Club FREE MEMBERSHIP IS BACK! February 13, 2019 by Laurie 9 Comments This post may contain affiliate links, which means if you click on a link and purchase something, I may earn a small commission (at no additional cost to you.) See my disclosure policy HERE. UPDATE: This offer was set to expire a few days ago – but they've EXTENDED it! 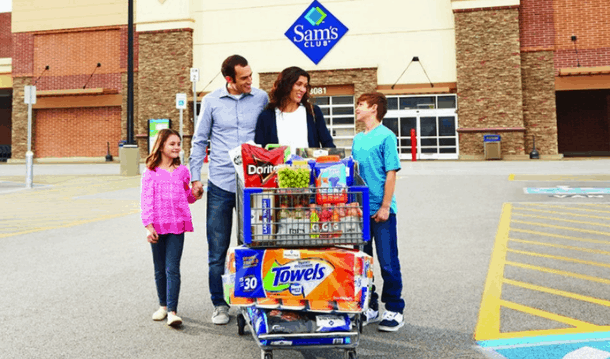 If you've ever wanted a Sam's Club Membership – now is an AWESOME TIME to get one! WOOHOOO! Right now when you purchase a Sam’s Club membership for $45, you'll get $45 back to spend at Sam's Club! That's like getting the membership for free! (Must purchase $45 worth of eligible items in a single transaction to get discount. Instant Savings items not included). If you’ve been considering a Sam’s purchase at all, this is definitely worth checking out! (Valid for new members only). NOTE: *The $45 incentive will be automatically deducted through Instant Savings at checkout when you purchase at least $45 in eligible products. I just did this but they emailed me a $5 gift certificate instead of a $45 one! Hi Janessa! Maybe try one more time (especially with a different email address if you have one?) I just tried it out and it worked for me, so I’m hoping it does for you this time! Hi Janessa! I did this deal a few days ago and then immediately upgraded to the $100 PLUS for an additional $55. I then got a $5 e-gift card (perhaps what you are seeing?). When I ordered online, the $45 was deducted. The $45 does not come as a gift card. You do not need to have PLUS or order online, but that was what I did. Hope this helps as this is an awesome deal. Hello. It is Friday evening on Jan 18. I keep clicking away to buy the Sam’s membership and get directed to an Acer Chromebook at Amazon. What am I doing wrong? Thanks in advnace for any help. Laurie, Why didn’t you address Janessa’s post? I would be interested in the answer. Thank you for catching this – we get so many messages but just tried the link myself and it worked for me. So weird! Just signed up but can’t seem to find a spot for my code or how to get the 45 off when I order. So I have basically paid the 45 without being able to use my code or is there something else I’m suppose to do?